1. The #1 Contributor to early tree mortality is planting too deep (buried root flare) and circling or girdling roots. 2. Plastic containers (PIP production) very frequently contain circling roots (see picture on the left side below). 3. Balled and burlapped (B&B) root balls contain significant amounts of valuable soil and often the root flare is planted too deep at the nursery, leading to premature mortality in the landscape. What is the best way to address these problems? The rootball on the left side was produced in a plastic container and has circling roots. 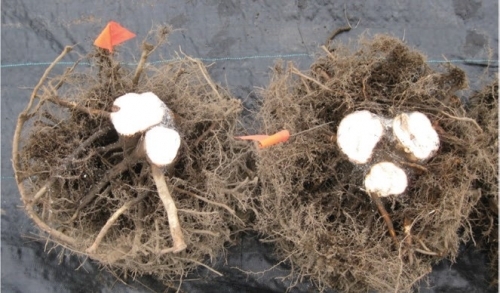 The rootball on the right side was produced in a grow bag and does not have circling roots. 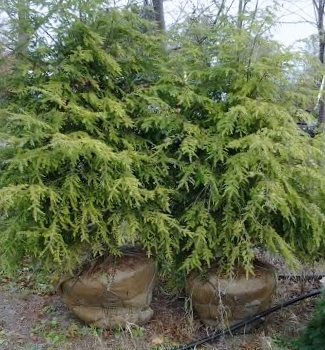 These 6 foot tall hemlocks have balled and burlapped root balls that weigh over 400 lbs and contain 1/4 of a cubic yard of valuable farm loam.